Storage Store the unopened product at 2 - 8° C. Protect from light. Do not use past expiration date. 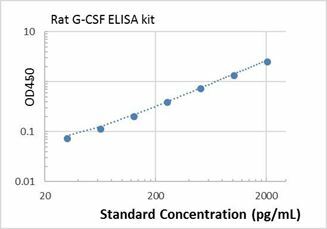 Specificity This assay has high sensitivity and excellent specificity for detection Rat G-CSF. No significant cross-reactivity or Rat G-CSF and analogues was observed. Suitable Sample Type serum, plasma, tissue homogenates, cell lysate, cell culture medium. 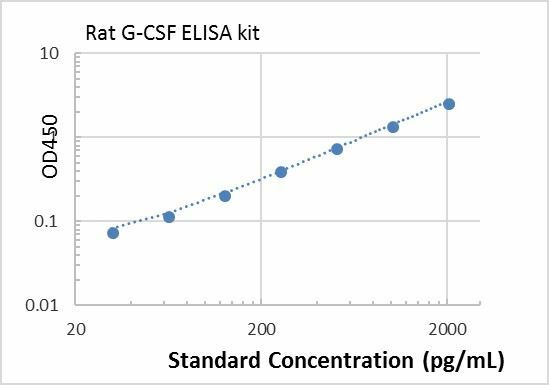 Typical Data ELISA: Rat G-CSF ELISA Kit (Colorimetric) These standard curves are provided for demonstration only. A standard curve should be generated for each set of samples assayed. Background Granulocyte-colony stimulating factor (G-CSF or GCSF), also known as colony-stimulating factor 3 (CSF 3), is a glycoprotein that stimulates the bone marrow to produce granulocytes and stem cells and release them into the bloodstream.Functionally, it is a cytokine and hormone, a type of colony-stimulating factor, and is produced by a number of different tissues. The pharmaceutical analogs of naturally occurring G-CSF are called filgrastim and lenograstim.G-CSF also stimulates the survival, proliferation, differentiation, and function of neutrophil precursors and mature neutrophils.